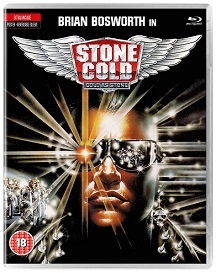 Stone Cold is out on Bluray on the 6th June, and to celebrate we have a great competition for you and 3 copies on Bluray to give away! Joe Huff (Brian Bosworth) is a cop who's angry at the system for handling criminals with kid gloves. He's on suspension but the FBI gives him an opportunity to go undercover in Mississippi and infiltrate "The Brotherhood", a white supremacist biker gang that runs drugs. In the Brotherhood, each member legally changes his name to his Brotherhood nickname. They're led by a violent psychopath named "Chains" Cooper. (Lance Henriksen). Joe begrudgingly accepts the job. As a member of the gang, Joe - renamed "John Stone" learns that they're plotting a paramilitary assault on the state capitol to rescue a gang member sentenced to execution and it's up to Joe to stop them.